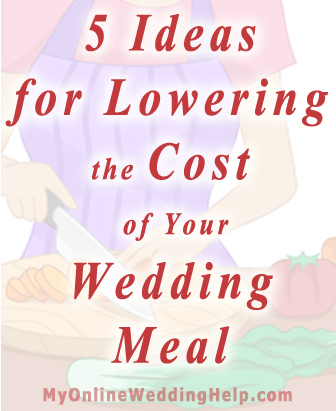 The choices themselves—what types of food, how much, and ingredients used to prepared each dish—go a long way in determining how much your reception meal will cost. There are several ways you can cut down without necessarily downsizing the wedding. 1. Offer fewer courses. Serving only appetizer or salad, a main meal with one side dish (consisting of starch plus vegetables), and cake for dessert is usually more economical than going with starters, soup, salad, multiple side dishes or entrees, and a full range of desserts. (a) Serve a “flight” of two or three small entrees on a single plate, with the more expensive choices only a few bites each. More chicken, less shrimp, for example. (b) Choose a meal that fits your budget and offers the guests no choices. These options can be difficult for those who are vegetarian/vegan or have special dietary needs. There is no way you can address all restrictions, but you can help alleviate the inconvenience by also offering one other selection—a gluten-free vegan plate with no meat or dairy. You can accomplish this by using nuts, lentils, or beans as the protein; preparing vegetables with straightforward spices and oil; and serving with rice or potatoes and vegan butter. Vegans, vegetarians, diabetics, and those with celiac disease or gluten or dairy allergies can then all safely eat the optional meal. If you are concerned about the latter four types of guests being forced to eat vegetarian, cook a meat entree with no butter and simple seasonings. Some foods are better at satisfying an appetite than others. 3. Serve food that is minimally processed and has a lot of fiber. Proteins are also filling. Specifically, potatoes, apples (because they contain filling pectin), beans, whole-grain bread, and proteins, such as chicken salad or ground beef, are all contenders for helping to satisfy your guests’ hunger and stay within a limited budget. 4. Serve pre-meal appetizers to help fill your guests up before the featured food, allowing you to decrease the entree’s serving size or go with a more premium selection. By offering a pre-meal hors d’oeuvres table, with dishes made with ingredients that are both filling and relatively inexpensive, you can decrease the entree serving size. Choose well, and you can lower the overall food bill. 5. Serve a pasta entree to more economically satisfy guests’ appetites. Even chock-full of meat and vegetables, it will be less expensive per serving than meat.